Practice Life Sciences questions and answers for interviews, campus placements, online tests, aptitude tests, quizzes and competitive exams. This set of Life Sciences Multiple Choice Questions & Answers (MCQs) focuses on “Lipid”. 1. What is the solubility of lipids in water? Explanation: In general, lipids are hydrophobic in nature due to the presence of hydrocarbon chains in their structure. These are poorly soluble in water but highly soluble in a nonpolar solvent like ether, chloroform, or benzene. 2. Fatty acids are amphipathic by nature. Explanation: Fatty acids are long-chain hydrocarbons and are the simplest form of lipids. Fatty acids are said to be amphipathic by nature as they have both polar and nonpolar ends. 3. Find the INCORRECT statement about the biological functions of lipids. Explanation: Exhibit increased catalytic activity is incorrect as all other options are correct. Lipids take part in a structural component of the membrane of animals, plants, or bacteria where it has protective functions. Lipid is also considered as the metabolic fuel of the body. 4. Which of the following is an example of unsaturated fatty acids? Explanation: The name of fatty acids is given by the number of carbons, and presence of a double bond, with the suffix -anoic in saturated fatty acid and -enoic in unsaturated fatty acids. 5. Name the two essential fatty acids? Explanation: Due to the unavailability of enzymes which induce double bond after C-9 is absent in mammals, they do not synthesize linoleate and linolenate. Hence, these two fatty acids are considered as essential fatty acids. Explanation: The melting point of fatty acids is determined by the length of the chain and number of the double bond. The longer the chain, the higher the melting point and the larger the number of double bonds the lesser the melting point. 7. Which of the following form of lipids are also referred as neutral lipids? Explanation: Triacylglycerols are the major form of stored lipids, it is hydrophobic, nonpolar, and do not have any charge; due to that it is also referred to as neutral lipid. 8. Name the reagent which is used in Saponification? Explanation: Triacylglycerol is hydrolyzed by alkali treatment which is known as saponification. The amount of KOH/NaOH is required to saponify one-gram of weight is known as saponification number. Saponification number measures the average weight of fat. 9. Which of the following is not a component of a phospholipid? Explanation: A phospholipid is composed of four components: a fatty acid platform, phosphate, alcohol attached to a phosphate and a platform of glycerol on which phospholipid built. Protein is incorrect as protein does not take part in phospholipid formation. 10. Which of the following phospholipid is considered as a major constituent of nervous tissue? Explanation: Sphingomyelin is a type of sphingophospholipids where phosphocholine group is attached to sphingosine. It is the major constituent in the nervous tissue of higher animals. 11. Which of the following sterol is present in the cell membrane of fungi? Explanation: Ergosterol is present in the cell membrane of fungi while rest stigmasterol, sitosterol, and campesterol are the types of sterol found in plants. 12. Identify the lowest density lipoprotein among the following? Explanation: Lipoprotein is the conjugation of lipids and proteins, majorly found in blood plasma and are classified based on their densities, into four types. Chylomicron possesses the lowest density (<1) among all four lipoproteins. 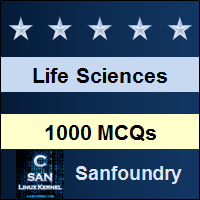 Sanfoundry Global Education & Learning Series – Life Sciences. To practice all areas of Life Sciences, here is complete set of 1000+ Multiple Choice Questions and Answers.